Dress up your studs today with these english style bits! If you enjoy jazzing up the studs you already have, then how about adding these english bit jackets to your collection. 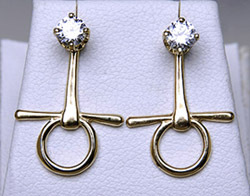 CUBIC ZIRCONIA EARRING STUDS NOT INCLUDED!